The in-mould label market is continuously growing globally at around 4.3% (Awa Global Inmould Study 2017), and more than two thirds of the worldwide production is required for food packaging. Heidelberger is now offering an enhanced rotary die-cutter based on the XL technology, in addition to food-safe, highly efficient print production. The Speedmaster XL 106-DD rotary die-cutter unites two key production steps in a single machine. The first unit places the injection hole in the label for the subsequent production process by means of a die on a magnetic cylinder with maximum precision. Up to now, this was a separate step that consequently extended the production time of the respective job. The cut out material is safely and reliably removed by means of an extraction system. The second unit of the XL 106-DD subsequently cuts out the contour of the label from the sheet. This combination of the two production steps in a single pass means a doubling of the die-cutting throughput, while makeready times and costs for die cutting tools can be reduced to half. 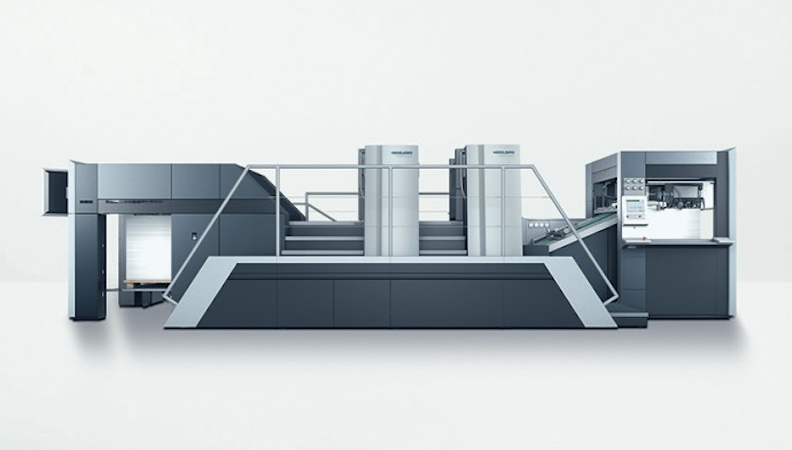 The XL 106-DD can process foils and papers at up to 10,000sph, which Heidelberg says is double the speed of a flatbed die-cutter, and takes materials ranging in thickness from between 0.05mm and 0.3mm. Apart from in-mould labels, the XL 106-DD can also cut plastic or paper packaging elements, such as POS items which, due to their design, need a ‘window’ or hole for mounting in the shelf or for attaching to the product. “A lot of customers are asking for this solution, who already have flatbed die-cutters but want the possibility to do hole punching and now we have the solution that they can completely change to rotary die-cutting,” commented Heidelberg product manager Philipp Doley to Printweek. “On a flatbed die-cutter the cutting process for the sheet has to stop completely and speed up 100% afterwards, so you always have a hard stop and a hard run. On rotary, the sheet is always moving." “The market is changing so if you have the possibility to cut and blend holes you can also speak about different kinds of holes, not only small injections but also the possibility to cut a window and extract the window in the label. So maybe this creates a new kind of product,” Doyle concluded.